Mondo Gecko and Future Donatello are working with the Mighty Mutanimals to finish off their new headquarters – a huge base disguised as a volcanic island. Once the work on the exterior of the Mutanimal’s base is finished, Mondo wants to celebrate – but the others are too tired. Merdude asks Mondo if he’d like to accompany him to a festival of mermaids and Glublubs, and the rockin’ Gecko agrees to make the trip. Mondo grabs a scuba suit and the two swim off together. In short order, a strange little fish creature arrives and speaks frantically to Merdude. Mondo is unable to understand the Glublub’s language, so Merdude explains that the festival is under attack! The two mutants hurry to investigate, and they spot a strange submarine (the same one that had grabbed Candy) chasing the mermaids. One of the maidens stops and offers herself as a sacrifice so her friends can escape – and Merdude realizes that it’s his girlfriend, Eowithe! The sub grabs the mermaid and zooms off into the ocean depths, with Merdue and Mondo in hot pursuit. Unfortunately Mondo can’t match the sub’s speed, and it escapes. MG is out of breath and struggling, so Merdue tells him he’ll take him to the surface, where he can rest. Inside the sub, Candy Fine meets her captor – a strange pirate called the Murk Mariner, whose speech is incomprehensible due to the mask that he wears. Fortunately (or unfortunately), the Murk Mariner’s first mate explains what the strange pirate captain is saying to the girl. The villains plan to ransom Candy and sell Eowithe to an aquarium. Candy is shocked to meet Eowithe, who speaks only a little English, but after what happened to Mondo, Ms. Fine is pretty unflappable. Candy angrily announces that she’ll get both of them out of this mess. Doom Nation and the band explains that they were hired by Candy Fine’s father to play on her yacht to cheer her up – which was going pretty well until she was kidnapped by a submarine with robotic arms. MG and Merdude quickly surmise that both of their friends are held captive by the same pirates, and the two set off to catch the crooks. This time Merdude summons a hammerhead shark for Mondo to ride, so he won’t get tired. On board the Murk Mariner’s sub, Candy picks the lock of her cell. With the help of Eowithe’s strong tail, they overpower the Mariner’s first mate and lock him up. Candy helps Eowithe transverse the vessel as the two look for a path to freedom. 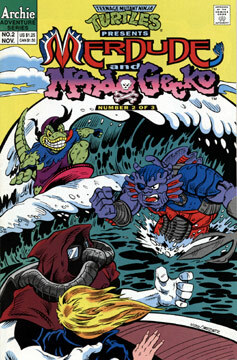 Merdude and MG find the sub resting on the floor of the ocean and are attacked by some scuba suited pirates. Our heroes have no trouble defeating their adversaries. Mondo suddenly arrives and tells his ex-girlfriend that he’s here to rescue her. Candy hugs MG and tells him that she doesn’t need to be saved. Merdude boards the sub and mans the controls, steering it back to Candy’s yacht, where Mondo and Ms. Fine bid farewell to their fishy friends. Later that night, after the yacht has been moored to the pier, Mondo and Candy walk on the beach. MG tries to make small talk, but Candy interrupts, telling him she has something to say. Mondo looks dejected and says that he knows she doesn’t want to hang with him anymore now that he’s a freak – but Candy announces that she doesn’t see him that way, that he’s the nicest boy she’s ever known, and that she wants to be his girlfriend again. Mondo is practically speechless in his joy. Nearby, a time portal opens, and Armaggon steps through it, vowing vengeance.